11/13/2014Inaugural Coppoc One Health Lecture (IUSM-Lafayette) -- tonight! On Nov. 3, the IU School of Medicine School Executive Committee, in collaboration with the Faculty Steering Committee, unanimously approved the IU School of Medicine Industry Relations Conflict of Interest (COI) Policy. The purpose of the policy is to provide an effective and practical set of rules and guidance to reduce, manage or eliminate conflicts of interest between industry and IUSM faculty, trainees, medical students and staff. The information contained within the policy is effective Jan. 1, 2015. However, for faculty who may not be in compliance with the approved policy, a grace period will be in effect until July 1, 2015, at which time full compliance will be required. "Maintaining the integrity of trust between physicians and patients is vital for our mission," said Jay L. Hess, M.D., Ph.D., IUSM Dean and vice president for university clinical affairs at IU. "At the same time, we need to foster research and innovation among our faculty if we are to provide better care in the future." The Conflict of Interest committee was first convened in February. The committee developed a draft policy in conjunction with a thorough review of policies at similar academic medical center as well as peer-reviewed literature and other important sources of information, including reports from the Pew Charitable Trusts and Institute of Medicine. The committee also consulted the previous IUSM Industry Relations policy. In addition, Alex Djuricich, M.D., chair of the IUSM Conflict of Interest committee, conducted personal discussions with several writers of the Pew document and the IOM report. "It was important to get opinions from many key stakeholders to guide the final version of the document," said Dr. Djuricich, who is also associate dean for continuing medical education at the IU School of Medicine. "Our committee was pleased to receive feedback from our engaged IUSM faculty, who provided outstanding suggestions for many portions of the final policy document." For more information, including the complete policy and an executive summary, visit the Conflict of Interest Policy's Web page. More than 60 works of art will be on display Nov. 21 when the seventh annual IUSM Art Exhibition “Scientific Inquiry, Artistic Expression” opens at 10 a.m. The exhibit, which includes works made of blown glass, concrete, oil and acrylic paint, needlework, photography and wool, will be open until 4 p.m. in the VanNuys Medical Science Building atrium. The exhibit showcases the work of the students, staff, faculty and alumni of the IU schools of medicine, nursing, dentistry and health and rehabilitation sciences, Fairbanks School of Public Health and employees of Roudebush VA, Eskenazi Health and IU Health. The one-day show in the atrium is followed by a month-long display in the IUPUI Campus Center Cultural Arts Gallery from Nov. 29 to Jan. 2. For more information, vist the IUSM Art Exhibition website. IU School of Medicine researchers have been awarded a $2.5 million National Institutes of Health grant to evaluate the advantages of physical exercise, cognitive exercise or a combination of both on the aging brain. The initial phase of the five-year project will be to develop a clinical study looking at ways to enhance cognitive abilities in older adults with mild memory loss. The project will build on the research experience of co-principal investigators Frederick Unverzagt, Ph.D., and Daniel O. Clark, Ph.D., and other researchers in the Indiana Alzheimer Disease Center, IU Center for Aging Research, Regenstrief Institute and IU School of Medicine. If this phase of the research is successful, the clinical study will be expanded to a multi-center study for people with mild cognitive impairment, which is estimated to affect about 5.4 million people in the United States, or about 22 percent of seniors over 71. About 12 percent of people with mild cognitive impairment each year go on to develop dementia. The behavioral study being developed will enroll 160 older adults with mild memory problems and have four arms: exercise only; cognitive training only; combined exercise and cognitive training; and general instruction on healthy aging. Participants will be exposed to the training in 36 sessions over the course of three months, with enrollment beginning in January. A new treatment regimen for hepatitis C, the most common cause of liver cancer and transplantation, has produced results that will transform treatment protocols for transplant patients, according to research published online Nov. 11 in the New England Journal of Medicine. The investigational three-drug regimen, which produced hepatitis C cure rates of 97 percent, is an oral interferon-free therapy. Previously, the typical treatment for hepatitis C after a liver transplant was an interferon-based therapy, usually given for 48 weeks. It had a much lower response rate, had a risk of organ rejection and was poorly tolerated because of the immunosuppressants required to prevent rejection. The new oral regimen -- ABT-450, ombitasvir and dasabuvir (with or without ribavirin) -- produces significantly fewer side effects and is prescribed for 24 weeks. First author Paul Kwo, M.D., professor of medicine at the IU School of Medicine and medical director of liver transplantation at IU Health, called the results of the international clinical study a "landmark achievement." The phase 2, multi-center trial enrolled 34 liver transplant recipients with hepatitis C who did not have cirrhosis. Of those, 33 patients or 97 percent exhibited no sign of hepatitis C virus at 24 weeks after treatment with the new drug regimen, and none suffered transplant rejection. In a similar phase 3 trial of non-transplant patients with cirrhosis, a historically difficult patient group to treat, the same treatment regimen produced a 96 percent cure rate for hepatitis C.
This international research study was funded by AbbVie. The results from this study and a phase 3, multi-center randomized study were presented Nov. 11 at the 2014 the American Association for the Study of Liver Disease annual meeting in Boston, Mass. People with a newly identified genetic variant perform better on certain types of memory tests, a discovery that may point the way to new treatments for the memory impairments caused by Alzheimer's disease or other age-associated conditions. In what the international research team is calling the largest study to date of human memory, an analysis of genomic data and memory test results from more than 14,000 older adults identified a location in the genome that was associated with better memory performance. The researchers noted that the gene has not been associated with cognition in the past. The research team, led by IU School of Medicine post-doctoral researcher and medical student Vijay K. Ramanan, Ph.D., and Andrew J. Saykin, Psy.D., director of the Indiana Alzheimer Disease Center and the IU Center for Neuroimaging, reported its results Nov. 11 in the journal Molecular Psychiatry. The genome-wide study found that better performance on tests of episodic memory was associated with a change in the DNA on chromosome 2 -- a G instead of the more common A nucleotide in a gene known as FASTKD2. The genetic variant -- known as a single nucleotide polymorphism, or SNP -- was also associated with a larger hippocampus and more dense gray matter in the brain on magnetic resonance imaging scans. The hippocampus is a brain structure involved in storing and retrieving memory. The FASTKD2 gene is responsible for the production of a protein involved in apoptosis, a process of programmed cell death. The researchers also examined cerebrospinal fluid samples from 82 participants and found lower levels of proteins associated with cell death in the participants with the memory-protective G variant. The inability to recall a recent current event, a newspaper article or what one had for dinner is one of the earliest symptoms of Alzheimer's disease and is also related to hippocampal atrophy. Gordon L. Coppoc, DVM, Ph.D., director of the IU School of Medicine-Lafayette and associate dean of the IU School of Medicine, will be stepping down from the position he has held for 16 years. Dr. Coppoc shared his news Nov. 8 during an open house at the newly dedicated Lyles-Porter Hall, the new state-of-the-art education facility that houses the IU School of Medicine-Lafayette and four clinics in Purdue University's College of Health & Human Sciences. Dr. Coppoc, who has taught for 43 years at Purdue University and IU School of Medicine-Lafayette, played a major role in making the new education facility a reality. His retirement will be effective Dec. 31. "After more than four decades on this campus, it is time to retire," Dr. Coppoc said. "I would like to share with you that for many years I have been wearing two pins on my lapel. One of them says 'Make Dreams Real,' and the other has the symbols of IU and Purdue with the words 'Working together for all of us.' Well, my 'dream' is now real because both IU and Purdue have worked together to make Lyles-Porter Hall a reality. I am grateful to have had this wonderful opportunity and look forward to observing what positive things are in store for local medical education." Dr. Coppoc has been the director of the Lafayette regional campus of the nation’s second-largest medical school since 1998. He is also co-founder of the Purdue Comparative Oncology Program, a component of the Purdue University Cancer, which celebrates its 35th anniversary this year. "Having leaders like Gordon whose dedication to IU School of Medicine’s mission is essential to achieving a vision like Lyles-Porter Hall, and vital to training physicians who want to serve this community," said Jay L. Hess, M.D., Ph.D., dean of the IU School of Medicine and vice president for university clinical affairs for IU. "We appreciate Gordon's long history of service and tireless efforts to advance regional medical education. IU and Purdue may compete in athletics, but we’re on the same team when it comes to academics and research. Gordon has been a valued member of both universities, and we’ve been fortunate to have him on our team." A reception hosted by the IU School of Medicine, the Purdue University College of Veterinary Medicine and Purdue’s Department of Basic Medical Sciences in honor of Dr. Coppoc's retirement will be Dec. 4. An interim regional campus director will be named in December and a search committee established to interview new director candidates. More than 60 researchers, sports medicine specialists and experts in concussion are gathering in Indianapolis this week to officially kick off one of the largest initiatives to study and prevent concussions. This week's meeting at the NCAA national office, which began Monday and will conclude Wednesday, will focus on the organizational, logistical and regulatory issues that the numerous institutions will need to resolve. Dr. McAllister said data collection has already begun for the project with the gathering of "baseline" data from athletes, data that will be used for comparison purposes with data gathered over the course of the project. Improvement in quality of life and reduced depression in both cancer patients and their caregivers were among the highlights of a pilot study titled "MODEL Care: Mindfully Optimizing Delivery of End-of-Life Care," recently presented by Shelley A. Johns, Psy.D., assistant professor of medicine at the IU School of Medicine and research scientist at the Regenstrief Institute. The presentation was featured at the inaugural meeting of the American Society of Clinical Oncology’s Palliative Care in Oncology Symposium in Boston on Oct. 24-25. The abstract from the pilot study was published in the ASCO meeting library. In the study conducted at the IU Simon Cancer Center, oncologists, a subset of their patients with advanced-stage cancer, and a family caregiver for each patient were enrolled in a mindfulness meditation intervention with the purpose of facilitating timely end-of-life conversations with greater ease. The MODEL Care intervention consists of a six-week program which included group sessions, guided mindfulness instruction, yoga and home mindfulness practice, as well as didactics on stress reactivity, palliative care and advanced care planning. In a novel approach, clinicians, patients, and caregivers were all enrolled in the mindfulness intervention which, according to Dr. Johns, has not been used before to support advance care planning in adults living with advanced-stage cancer. The study was funded by the Walther Cancer Foundation through a training grant to the IU Health Fairbanks Center for Medical Ethics. Dr. Johns will present a similar talk as part of the Mary Margaret Walther Program in Palliative Care Research and Education symposium, "Passages and Promises: Innovations in Palliative Care Research, Education and Communication," on Nov. 17 to 18 at the IUPUI Campus Center. The IU School of Medicine Orchestra will present its annual fall concert at 2 p.m. Sunday, Nov. 23, at the Indiana History Center, 450 W. Ohio St., Indianapolis. The concert is free and open to the public and will feature more than 40 musically talented medical and dental students, medical residents, faculty and staff of the IU schools of medicine and dentistry. Selections will include "Rhapsody in Blue" by George Gershwin featuring soloist Woody Han, the overture to "The Merry Wives of Windsor" by Otto Nicolai, and "Night on Bald Mountain" by Modest Mussorgsky. David Schurger is conducting. A coffee and cookie reception will follow the performance. This event is sponsored by the IUSM Office of Medical Service Learning. The IU School of Medicine Department of Psychiatry is experiencing an exciting period of growth and transformation. The department has recently moved into the new IU Health Neuroscience Center, which facilitates collaborate with colleagues in neurology, neurosurgery, the neuroimaging center, physical medicine and rehabilitation, and others to treat individuals with neuropsychiatric disorders. 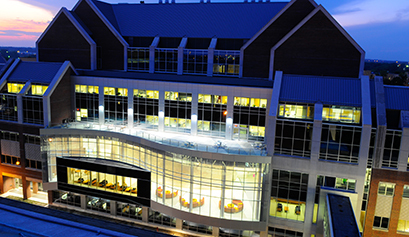 The school has also recently opened a state-of-the-art IUSM Neuroscience Research Building, connected to the IU Health Neuroscience Center, which brings together neuroscience researchers from across the school, including the Institute for Psychiatric Research, a part of the Department of Psychiatry. As part of this growth, the IUSM Department of Psychiatry seeks qualified applicants for both clinician-scientist and clinician-educator faculty positions. These positions offer exciting opportunities for research and program leadership and development, and a unique opportunity to influence the direction of the department. Appointments will be on the clinical or tenure track, commensurate with qualifications and experience. An M.D. or equivalent and/or a Ph.D. is required; clinicians must be board certified (or eligible) and eligible for licensure in the State of Indiana. Strategic recruitment of clinicians and clinician scientists are not limited to the specific job openings listed here. The department encourages exceptional clinician and clinician scientist applicants to inquire about other opportunities to join our growing team. Current opportunities for clinician scientists include positions in interventional neuropsychiatry, neurotrauma neuropsychiatry, addictions, geropsychiatry, and autism and neurodevelopmental disorders. Current opportunities for clinician educators include positions in consultation-liaison psychiatry, adult outpatient psychiatry, and child and adolescent outpatient psychiatry.Complete position descriptions are online. Interested candidates should submit CVs (Attn: Dr. Thomas McAllister, Department Chair) to majhughe@iupui.edu and include "Psychiatry Faculty Jobs" in the subject line. The priority submission deadline is Saturday, Dec. 20. For additional information, visit the Department of Psychiatry website. The Indiana Clinical and Translational Sciences Institute is seeking applicants for special predoctoral training awards in translational research. In biomedical terminology, translational research refers to "bench to bedside," the process by which research in the lab "translates" into patient treatment. Translation may involve applying discoveries made during research (in the lab, through animal studies, etc.) to the development of clinical trials and studies in humans, or carrying out research aimed at enhancing the adoption of best practices, or both. These two types of translational research are described as consisting of either "T1 research," i.e. : basic biomedical research or the study disease at a molecular or cellular level as it progresses to the development of new treatment options at the clinical level; or "T2 research," i.e. : enhancing access to and the adoption of evidence-based strategies in clinical and community practice, institutionalizing programs, products, and services to improve health. These awards are aimed at pre-doctoral students whose research is at any point along this spectrum. Funding is for two years with the second year of funding contingent upon satisfactory progress. Benefits include a stipend as well as health insurance and partial coverage of tuition and fees. Awards will start July 1, 2015. Trainees will be required to participate in a translational science course, attend a National CTSA meeting and present their work at several Indiana CTSI pre-doctoral gatherings during the academic year. Interested candidates will be pre-screened for eligibility and must submit a copy of their CV to ictsi@purdue.edu by Monday, Nov. 24. 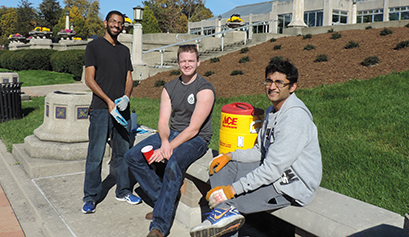 Complete applications are due Monday, Dec. 8, to ictsi@purdue.edu. Questions to Colleen Gabauer at 765-496-1016. Applications are open for grant awards from the Ralph W. and Grace M. Showalter Research Trust. The areas of eligible biomedical research are broad and described by the benefactors as “the type of medical research that is most likely to permanently benefit mankind.” Donor intent prohibits the use of Showalter Trust funds for research in psychiatry, sociology, or social studies. Larry D. Cripe, M.D., associate professor of medicine at the IU School of Medicine, will become editor-in-chief for the National Cancer Institute Physician Data Query (PDQ) Supportive and Palliative Care editorial board in March 2015. The board is responsible for developing and maintaining evidence-based PDQ cancer information summaries for health professionals and the public.